As part of a design/build team, which included ECCO III Enterprises and Hardesty & Hanover, LHPA upgraded four NYC subway stations on the Eighth Avenue Line (W. 72nd Street, W. 86th Street, W. 163rd Street/Amsterdam Avenue and Cathedral Parkway/W. 110th Street.) The work was done under NYC Transit Authority’s Enhanced Station Initiative (ESI). 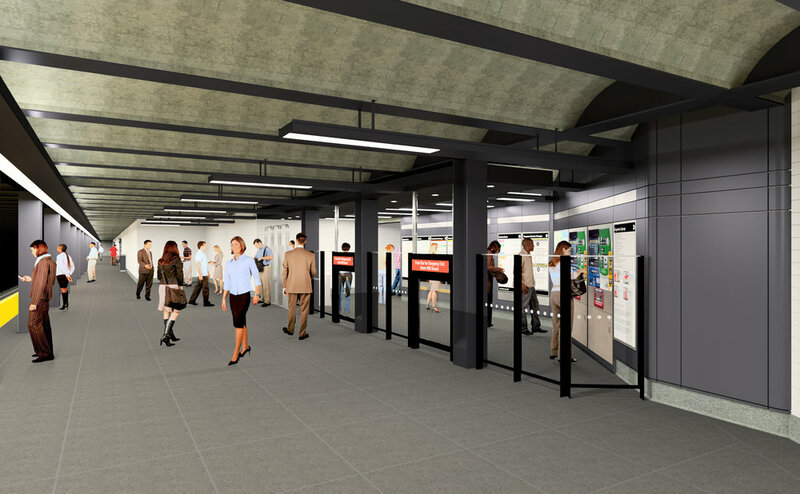 The Enhanced Station Initiative is a rehabilitation program undertaken by the NYC Transit Authority with the objective of transforming existing stations into modern and sophisticated transit facilities that are safe, forwardthinking, and user friendly. The objectives of the projects are to improve the reliability, capacity and customer experience inside the subway system. LHPA has a long history of working with the NYC Transit Authority, having completed numerous station upgrades including award-winning projects at E. 180th Street in the Bronx and Bleecker Street in Manhattan. Our work has involved preservation of historically significant finishes, collaborations with artists engaged in the NYCT’s Arts for Transit program, and technical issues such as ADA access and improved circulation.